Living in a small country with a total of 5.5 million inhabitants, Danes may feel trapped in their own territory and, as a result, become bored with their immediate surroundings. 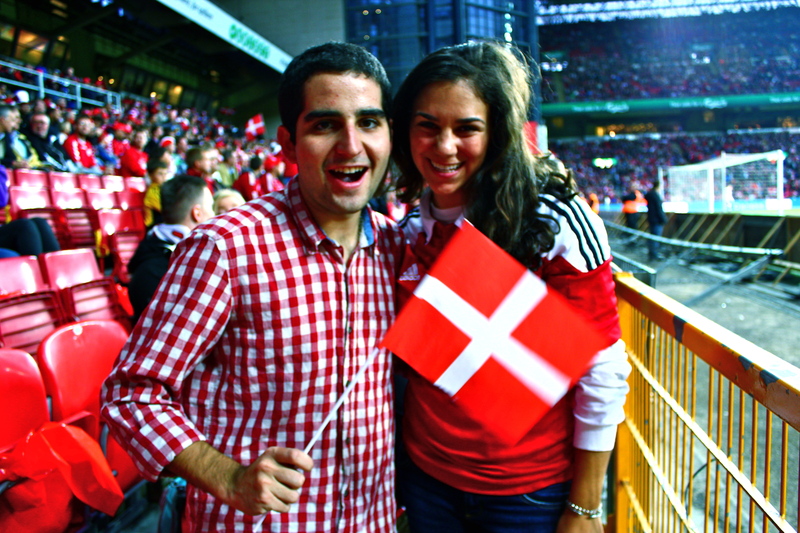 However, if there is anything that boosts nationalistic fervor and gets Danes excited about their country, it’s soccer. I mean, football. The Danes make the distinction very clear: Americans call it soccer, the rest of the world calls it football. And because I’m supposed to “immerse” myself while abroad, I’ll refer to it as football in the remainder of the post. After attending my first F.C. København (FCK) game, I gained a new outlook on Danish sports etiquette–an outlook that certainly defied all my perceptions of football culture, specifically fan behavior. Upon arriving at the Parken stadium (the home of FCK), my friends and I were greeted by smiling, intoxicated FCK loyalists. We had purchased tickets for this particular game against a Czech national team only a few days before the game, so we were assigned to seats randomly. The odds, however, were in our favor. We ended up getting placed in front row seats behind one of the goals, right behind a row of probably the friendliest yet most belligerent FCK fans I will ever meet. These die-hard fans greeted us with open arms, excited to know about our “American” perception of football and teach us the basics of Danish football culture. 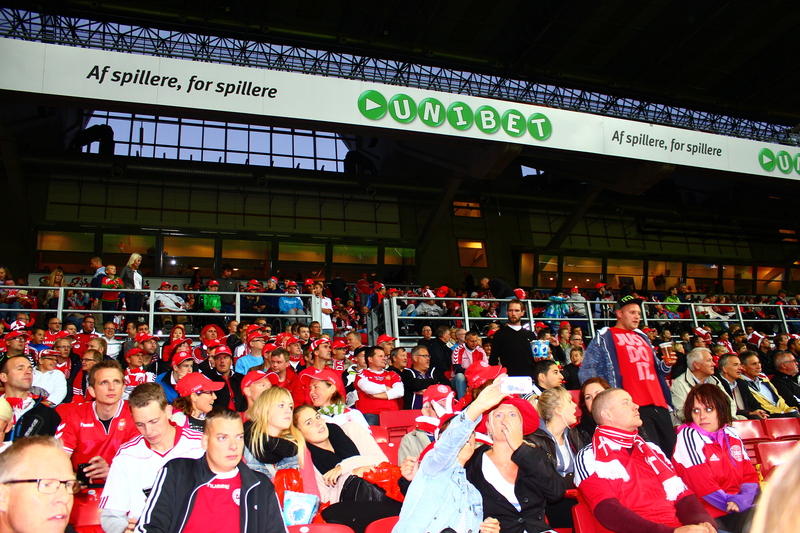 By the time the game had ended (unfortunately in a draw, 0-0), our new friends made us fluent in Danish football chants. The game wouldn’t have been nearly as exciting without these guys sitting right behind us. What surprised me the most was the sense of respect Danes had for their opponents. Televised football games inevitably dramatize the pride of the fans, almost always in the form of altercations between the fans. As much pride as FCK fans may have, they treated their Czech opponents like guests in their homes. FCK fans would clap when the Czech team made a great play, sometimes giving a high-five to the Czech fans who had travelled to Denmark to watch their team play. 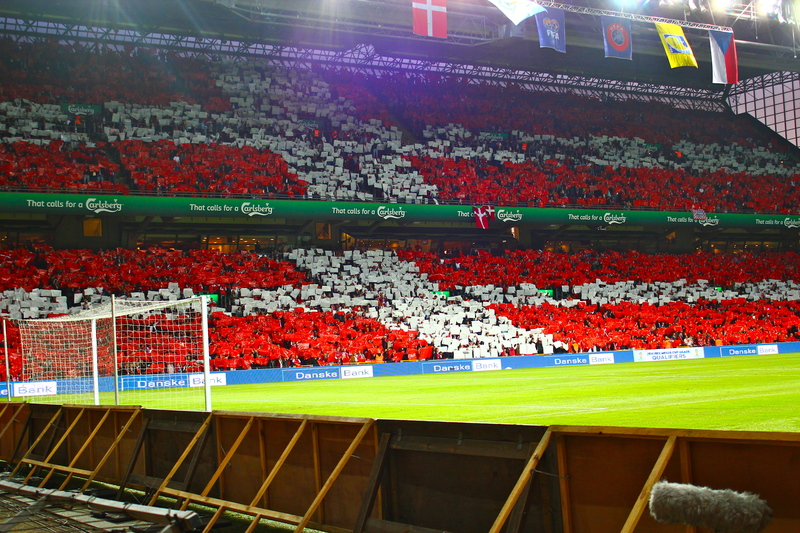 I cannot wait to attend my next FCK game, especially since I had decked myself out in red and white (colors of the Danish flag) and made a small 10 kroner purchase of paper Danish flags at Tiger (the equivalent of a dollar store in the U.S.–only much nicer).